At Arundel Estate, we believe that the essence of love is time. Our designs create more than a stop at the local restaurant. 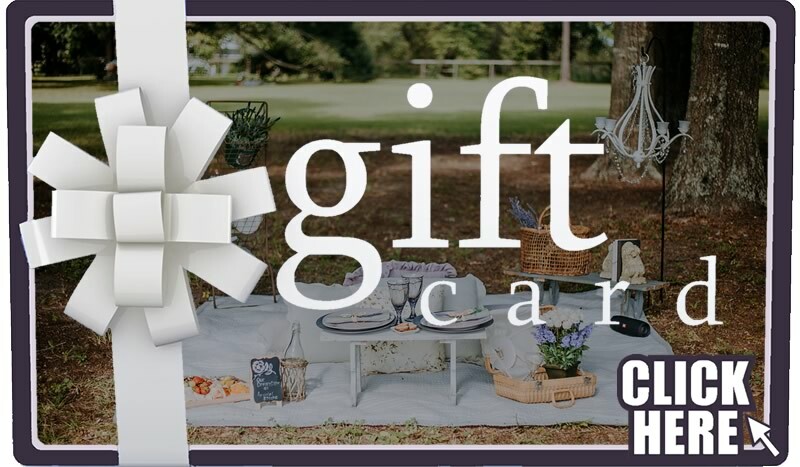 Whether you’re looking for a unique way to spend time, celebrating a birthday, anniversary, or looking for the perfect way to propose. Or … for an occasion where ordinary just won’t do. 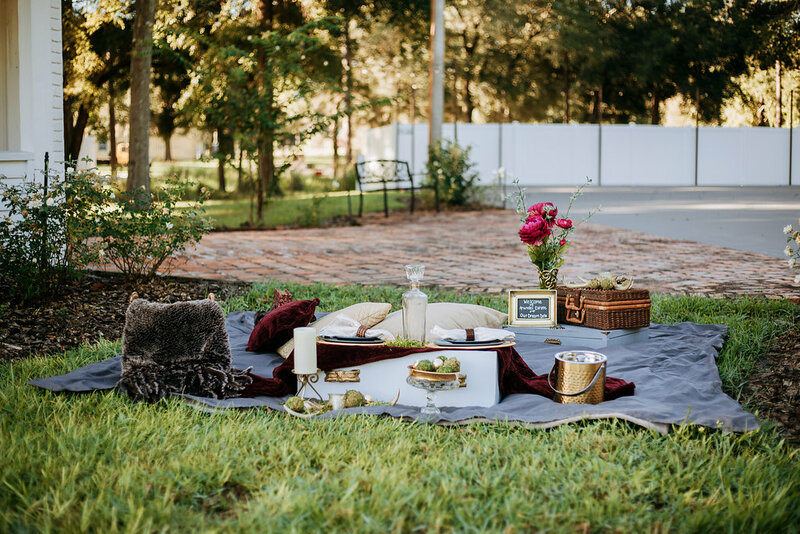 From a romantic Picnic to an elegant Table for Two, pick the theme or the location and we will do the rest. We invite you to choose the best one to celebrate that special moment together. 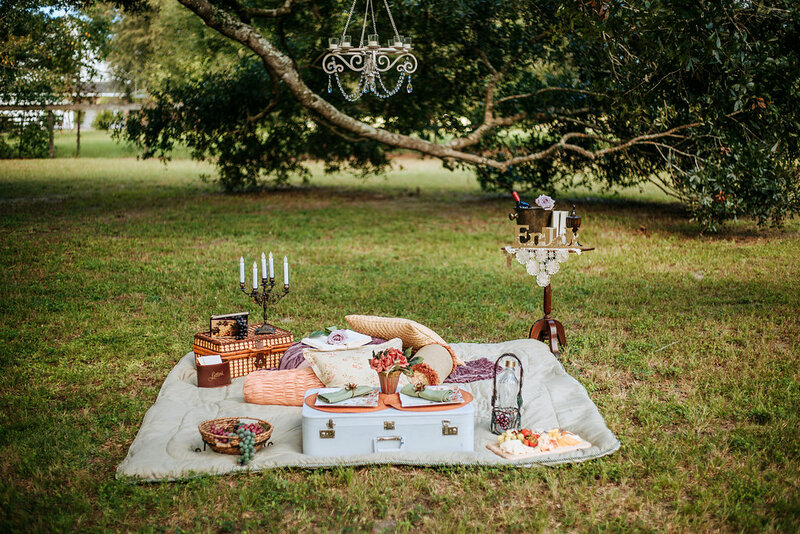 Simply choose your theme and setting, Picnic or Table for Two and we handle the rest. All Inclusive pricing: Picnic $250, Table for Two $300. Starting time at 6:00 PM for each theme and setting. Gift Cards Available Now For Online Purchase. Lavender is at the heart of Arundel Estate, and it’s why we’ve created the Cherie Amore. 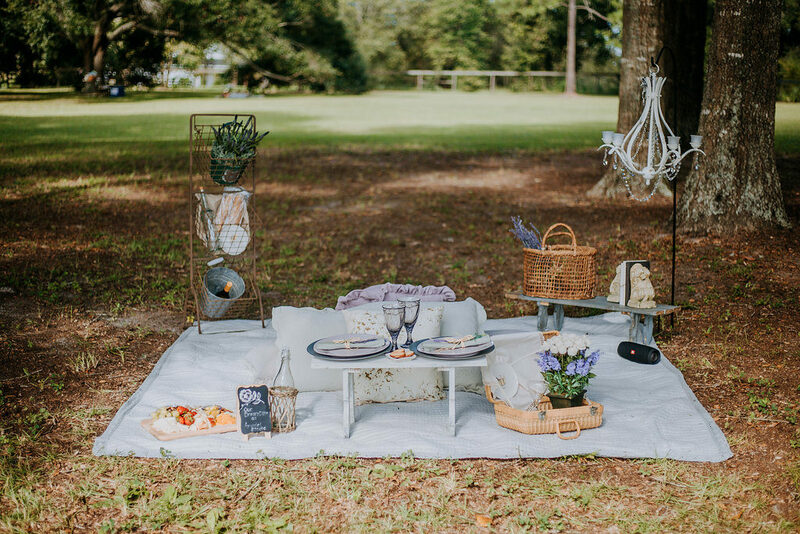 This romantic Picnic setting is placed along our beautiful oak trees with a view of the Arundel lavender field. The Table for Two is on the Grand Terrace overlooking the waterfall while enjoying your own private space. 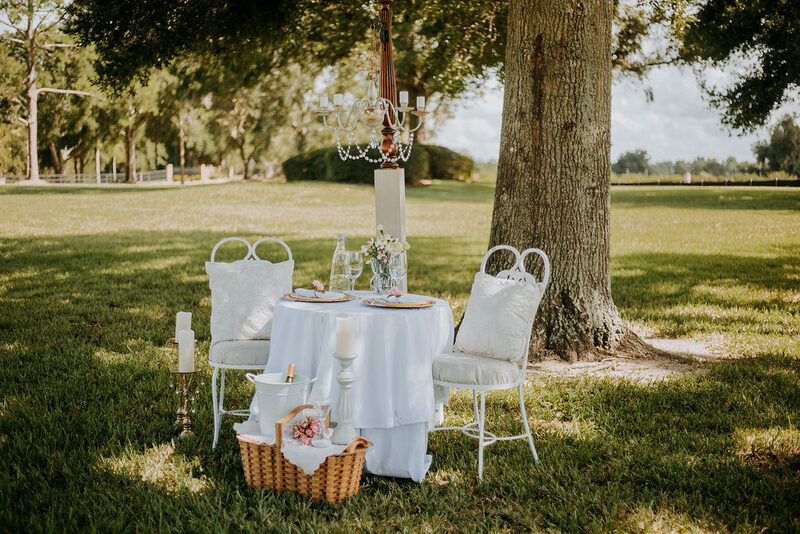 Placed in front of the Estate itself, this beautiful romantic setting is designed with soft colors, pillar candles, and chandelier all set in the Estate’s natural surroundings. 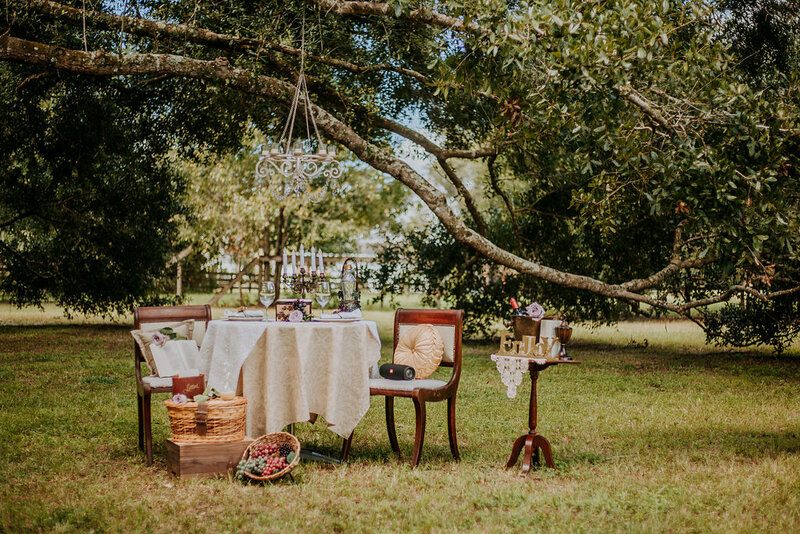 With this elegant Dream Date, you are surrounded by the beauty of The Oaks canopy. This poetic setting brings out the hopeless romantic with crystal chandelier, roses, and wine. 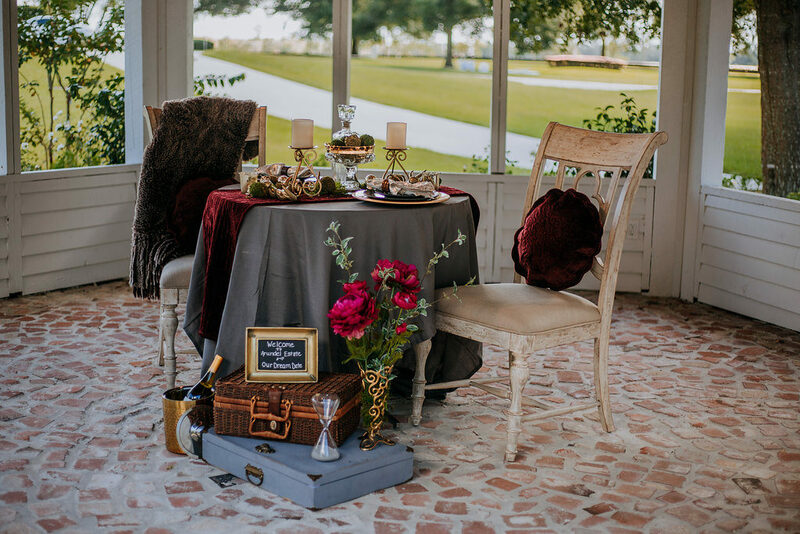 This passionate Dream Date setting located within the majestic gazebo complete with chandelier. The deep burgundy and gold accents create that warm hearted feeling while you embrace the Market Square surroundings. All our Gourmet meals and beverages are prepared and Served by award winning chef Ian Schneider FMP owner of Orlando Prestige Catering and his team. Each item is prepared with high quality ingredients, giving special care to the flavors the chef wants you to enjoy. Table for Two includes: Complete Gourmet Dinner, Wine and dessert. Choose from the (4) options below. Ready To Book Your Arundel Estate Dream Date? Call, Email, Facebook Message or fill out our short form below to reserve. "This experience was breathtaking and extremely romantic, if that is what you are looking for you have found the right place! 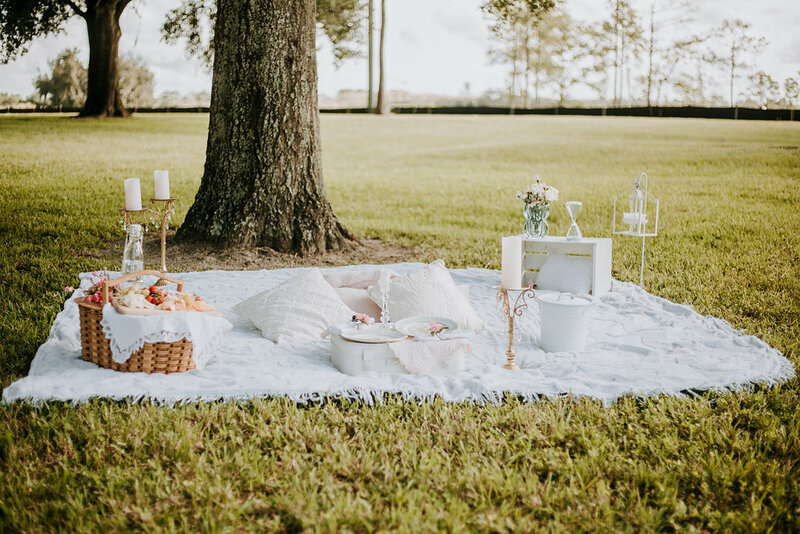 Our experience with Arundel Dream Dates was AMAZING, they provide the perfect setting to enjoy your loved one and have a peaceful evening under the stars. 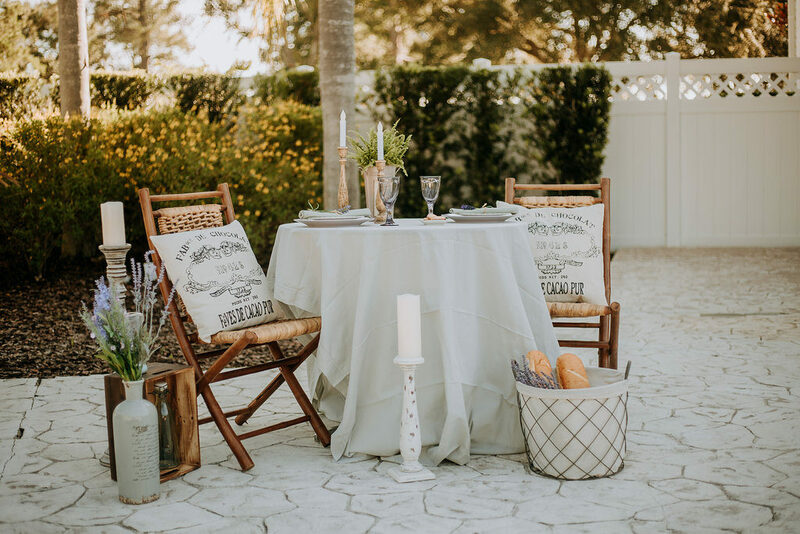 It was wonderful having the ability of creating our own ambiance by adding that personal touch of playing our favorite music playlist while sipping on a glass of wine and being away from it all. Our perfect mini gateway!"